We had a very moving thanksgiving mass for Fr. Gear yesterday in Ballyneale Church. 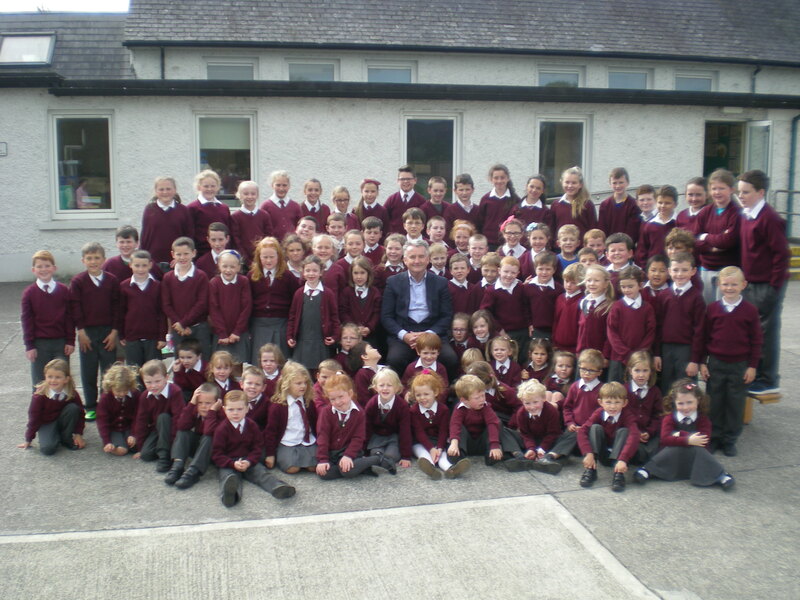 Pupils, parents and staff will all really miss Fr. Gear and we wish him the best of luck in his future parish. A thanksgiving mass for Fr. Gear and his contribution to the community is taking place this Thursday the 24th at 10 a.m in Ballyneale Church. All pupils from the school will attend and all parents are welcome. We will all really miss Fr. Gear and we wish him the best of luck in his future parish. The Health Promoting Schools flag will be raised on Friday the 2nd October at 1.30 p.m. We will be welcoming back last year’s committee to help raise the flag. All parents are welcome to attend. More details in the coming weeks. The girls are taking part in a football blitz on Wednesday the 7th October at 11.30 in Moyle Rovers. They will be playing against Lisronagh, Knockavilla, New Inn and Gaelscoil Carrick-on-Suir. The boys will be playing Templetuohy, Lisnamrock and Lisronagh in their first blitz of the school year. Over the summer, Ballyneale pupils won €100 for their entry into the Clonmel Show’s history competition. With their winnings, the students are going to subsidise a trip to the Sleeping Beauty panto on Monday the 21st December in Limerick University’s Concert Hall. The Annual General Meeting of the National Parents Council [primary] takes place on Saturday the 26th September at 11 am in The Ashling Hotel, Parkgate St, Dublin 8. An 8 week parenting course for parents of 9-17 year olds is taking place every Monday evening at 7pm from the 21st September in the Presentation School, Clonmel. The aim of the course is to support parents in building good relationships with their children. The course is free and covers topics ranging from communication, peer pressure to conflict resolution. Contact Catherine at the Health Promotion Office on 052 6177930 or text your name and details to 087 9371973.